Boracay serves as one of the top most destination around the world, and before every traveler can plunge in and enjoy every moment this wondrous island can offer, no one should miss its spectacular gateway of Malay. 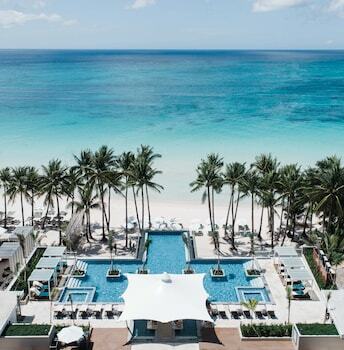 Malay offers various activities... Boracay serves as one of the top most destination around the world, and before every traveler can plunge in and enjoy every moment this wondrous island can offer, no one should miss its spectacular gateway of Malay. Travelers who would like to explore Malay can have a perfect accommodation experience around, and one of the rightful choice is CASA VENICIA - where guests can easily access various sight and wonders of both Malay and Boracay Island. Each room at this Hotel is air conditioned and has a flat-screen TV, A terrace or balcony are featured in certain rooms. Each room has a private bathroom with a bidet and Hot & Cold shower, with complementary breakfast, coffee and Ice tea. The property offers free shuttle from Caticlan going to Property. The Guesthouse facilities also varies according to each traveler’s needs, from telephone in all rooms,Wifi- Facilities, 24-hour Front desk, daily housekeeping, and an in-house restaurant, and a spacious parking. The nearest airport is Godofredo P. Ramos (Caticlan) Airport, 5 km from the property. It takes 5-7 minutes. Centillo Travellers Inn is a hotel in Caticlan, Malay, Aklan which offers quality accommodation and great service with its hospitable staff. The hotel lies from the island center and provides accessibility to important town facilities. With its conve... Centillo Travellers Inn is a hotel in Caticlan, Malay, Aklan which offers quality accommodation and great service with its hospitable staff. The hotel lies from the island center and provides accessibility to important town facilities. With its convenient location, the hotel offers easy access to the island's must-see destinations. It features modern air conditioned rooms equipped with balcony, free wifi access throughout the hotel with parking area. The hotel is 1 kilometer away from Caticlan Airport and 3 minutes away from Caticlan Jetty Port. With a stay at Savoy Hotel Boracay Newcoast in Malay, you'll be near the beach and minutes from CityMall Boracay and close to D'Mall Boracay. This 4-star hotel is within close proximity of Happy Dreamland and Mt. Luho. Make yourself at home in one of the 559 air-conditioned rooms featuring refrigerators and LED televisions. Rooms have private furnished balconies. Complimentary wireless Internet access is available to keep you connected. Private bathrooms with showers feature complimentary toiletries and hair dryers. Don't miss out on recreational opportunities including an outdoor pool and a fitness center. This hotel also features complimentary wireless Internet access, tour/ticket assistance, and a ballroom. Enjoy a meal at the restaurant, or stay in and take advantage of the hotel's 24-hour room service. Relax with your favorite drink at the bar/lounge or the poolside bar. Breakfast is available for a fee. Earn as much as 409 points. Located in Malay, Pinnacle Boracay is by the ocean and minutes from Willy's Rock and Holy Rosary Church. 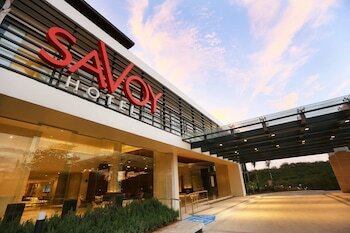 This 4-star hotel is within close proximity of Happy Dreamland and D'Mall Boracay. Make yourself at home in one of the 45 air-conditioned rooms featuring minibars and flat-screen televisions. Complimentary wireless Internet access keeps you connected, and cable programming is available for your entertainment. Bathrooms have showers and complimentary toiletries. Conveniences include desks and electric kettles, and housekeeping is provided daily. Featured amenities include a 24-hour business center, a 24-hour front desk, and an elevator (lift). A roundtrip airport shuttle is provided for a surcharge (available 24 hours), and free self parking is available onsite. With a stay at Hue Hotels and Resorts Boracay in Malay, you'll be connected to a shopping center, within a 5-minute drive of White Beach and Budget Mart. 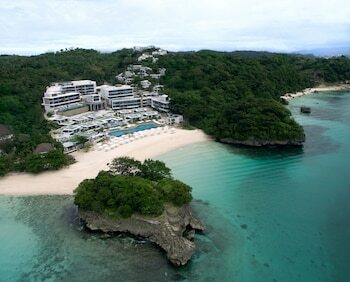 This 4-star resort is 3.3 mi (5.3 km) from Caticlan Jetty Port and 3.3 mi (5.3 km) from Puka Beach. Make yourself at home in one of the 127 air-conditioned rooms featuring minibars and LED televisions. Complimentary wireless Internet access keeps you connected, and cable programming is available for your entertainment. Private bathrooms with showers feature complimentary toiletries and bidets. Conveniences include phones, as well as safes and desks. Don't miss out on recreational opportunities including an indoor pool and a fitness center. Additional amenities at this resort include complimentary wireless Internet access, concierge services, and shopping on site. Satisfy your appetite for lunch or dinner at the resort's restaurant, Fresco, or stay in and take advantage of the room service (during limited hours). Quench your thirst with your favorite drink at the poolside bar. Buffet breakfasts are available daily from 6:30 AM to 10 AM for a fee. Featured amenities include a business center, dry cleaning/laundry services, and a 24-hour front desk. A roundtrip airport shuttle is provided for a surcharge (available 24 hours), and limited parking is available onsite. Earn as much as 491 points. With a stay at Henann Crystal Sands Resort in Malay, you'll be on the beach, within a 5-minute drive of White Beach and Coral Garden. This 5-star hotel is 3.2 mi (5.2 km) from Puka Beach and 3.9 mi (6.3 km) from Caticlan Jetty Port. Make yourself at home in one of the 188 air-conditioned rooms featuring LCD televisions. Complimentary wireless Internet access keeps you connected, and cable programming is available for your entertainment. Private bathrooms have complimentary toiletries and bidets. Conveniences include safes and desks, and housekeeping is provided daily. Enjoy a satisfying meal at Sapphire serving guests of Henann Crystal Sands Resort. Buffet breakfasts are available daily from 6 AM to 10 AM for a fee. Earn as much as 811 points. With a stay at Crimson Resort & Spa Boracay in Malay, you'll be on the beach, within a 10-minute drive of Puka Beach and Punta Bunga Beach. 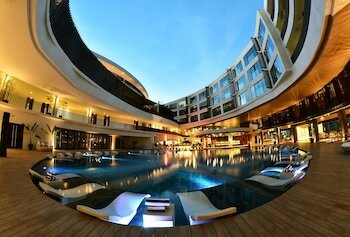 This 5-star hotel is 3.1 mi (5 km) from White Beach and 6.2 mi (10 km) from Caticlan Jetty Port. Make yourself at home in one of the 192 air-conditioned rooms featuring minibars and LED televisions. Rooms have private furnished balconies. Complimentary wireless Internet access keeps you connected, and cable programming is available for your entertainment. Private bathrooms with separate bathtubs and showers feature complimentary toiletries and hair dryers. Dip into one of the 2 outdoor swimming pools or enjoy other recreational amenities, which include a fitness center. Additional features at this hotel include complimentary wireless Internet access, concierge services, and babysitting/childcare (surcharge). Enjoy international cuisine at Saffron Cafe, one of the hotel's 3 restaurants, or stay in and take advantage of the 24-hour room service. Quench your thirst with your favorite drink at the beach bar. Buffet breakfasts are available daily from 6:30 AM to 10:30 AM for a fee. This one-bedroom apa... Located at Unit E, Cluster D, 5th Floor of the world's renowned Oceanway Residences. A luxurious condominium unit. Fully furnished with a fantastic sea view and relaxing mountain scenery of the northern part of Boracay Island. Torres Lodge is situated in the busiest part of Caticlan where tourists stay before going to Boracay Island. It is the most preferred budget friendly accommodation in the area because of its location near Caticlan airport, Jetty port, van terminals, ... Torres Lodge is situated in the busiest part of Caticlan where tourists stay before going to Boracay Island. It is the most preferred budget friendly accommodation in the area because of its location near Caticlan airport, Jetty port, van terminals, convenience stores and food establishments. With a stay at Feliz Hotel Boracay, you'll be centrally located in Malay, steps from White Beach and 3 minutes by foot from Coral Garden. This 4-star hotel is 3.3 mi (5.3 km) from Puka Beach and 3.5 mi (5.7 km) from Caticlan Jetty Port. Make yourself at home in one of the 80 air-conditioned rooms featuring minibars and Smart televisions. Complimentary wireless Internet access keeps you connected, and cable programming is available for your entertainment. Private bathrooms with showers feature complimentary toiletries and bidets. Conveniences include phones, as well as safes and electric kettles. Don't miss out on recreational opportunities including an outdoor pool and a fitness center. This Colonial hotel also features complimentary wireless Internet access and concierge services. Grab a bite at La Plaza, one of the hotel's 2 restaurants, or stay in and take advantage of the 24-hour room service. Quench your thirst with your favorite drink at the bar/lounge. Buffet breakfasts are available daily from 6:30 AM to 10:30 AM for a fee. Sur Beach Resort is located in Barangay Balabag, Station 1, Boracay Island. Like other accommodations in Boracay – Station 1, Sur Beach Resort Boracay presents some of the nicest rooms in the island. But the thing that separates it from other propert... Sur Beach Resort is located in Barangay Balabag, Station 1, Boracay Island. Like other accommodations in Boracay – Station 1, Sur Beach Resort Boracay presents some of the nicest rooms in the island. But the thing that separates it from other properties in the area is its unbeatable rates. Furthermore, all rooms are air-conditioned and feature wood flooring. They are equipped with private bathroom facilities, cable TV and a fridge. A hair dryer and a safe are also available. One thing travelers can be sure of when it comes to the island of Boracay in the Philippines: it’s going to be the same tropical paradise they love every time. Sur Beach Resort Boracay understands this and envisions a return to the Boracay vacation that’s peaceful and gentle while still offering high-energy adventures and exciting nightlife. Since opening in 2005, tourists have been raving about Sur Beach Resort’s peaceful surroundings, well-appointed rooms, and outstanding service. It features 46 thoughtfully furnished lodgings, 6 cabanas, a beachfront bar and dining area, plus a roof deck with spectacular views. Faith Village is located in Barangay Manoc-Manoc, Boracay Island. It is a 3 minute walk away from the award winning Boracay Beach Station 3; consistently voted as one of the worlds top 10 beaches. Near Faith Village are variety of restaurants, and sh... Faith Village is located in Barangay Manoc-Manoc, Boracay Island. It is a 3 minute walk away from the award winning Boracay Beach Station 3; consistently voted as one of the worlds top 10 beaches. Near Faith Village are variety of restaurants, and shops that offers spas and beach activities. Faith Village Gardens has a variety of affordable rooms available. Ranging from private rooms to 20 dorm beds accommodation. Each room is non-smoking and has air-conditioned, toilet and bath and cable TV. Our convention Center can host up to 300 guest. The Dining Hall allows groups to prepare or preorder meals. Hugin & Munin Coffeeshop provides refreshments and small meals in a relaxed and open spaced atmosphere. Breakfasts can be booked with every reservation at discounted rate.